More often than not I don't have any particular meal in mind when I go food shopping. I like to let the fresh produce availability inspire me. This week, I walked into Whole Foods and they had a lovely display of organic mangoes on sale. Mango Salsa was my first thought. Ok, that's great, but what do I serve that with? 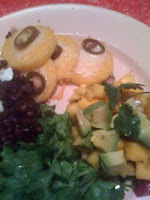 Hmmmm... mangoes make me think of South America and that made me think of corn, so... Polenta! And black beans. Now that's a healthy meal, and a fairly simple one at that. Here's my mango salsa recipe for your enjoyment. I can tell you, after snacking on it at lunch today, its even better two days later. Combine all ingredients and serve- its that simple. I also topped it on the plate with fresh, cubed avocado and served it with chopped lettuce. If you plan on making this to scoop with tortilla chips, cut the mango smaller. I do highly recommend making this salsa ahead of time as well, although it was quite delicious fresh. For the polenta, they were out of bulk polenta grain, so I got an organic, pre-packaged tube. I sliced it in 1/2" slices, sprayed a baking sheet with canola oil, cooked both sides for 10 minutes at 400 degrees (or until slightly brown on both sides). For the last 2 minutes I sprinkled a little shredded cheddar on top and on slice of jalapeno. *I apologize for the poor quality photo, although I am grateful to Jim for quickly snapping a pic of his plate with his iPhone before we ate it all up.